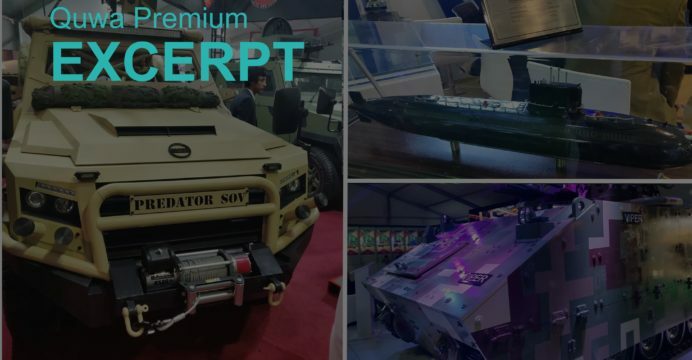 On 27-30 November 2018, Pakistan held its biennial defence tradeshow, the 2018 International Defence Exhibition and Seminar (IDEAS) in Karachi, Pakistan. Quwa will release a series of articles from its coverage of the event, but this article will summarize most of what we learned at the event. It was clear that China and Turkey were Pakistan’s dominant defence partners. Not only did the suppliers from these countries maintain the largest exhibits at IDEAS, but their efforts were pervasive. Most will be aware of the contracts Pakistan already signed with the likes of China Shipbuilding Industry Corporation (CSIC) and others, but most bids and ongoing contract negotiations involved suppliers from China or Turkey. For example, the Pakistan Navy (PN) is negotiating with Turkish Aerospace for the Anka-S medium-altitude long-endurance (MALE) unmanned aerial vehicle (UAV), ASFAT A.S. is submitting a bid for the PN’s submarine rescue vessel bid, the Aviation Industry Corporation of China (AVIC) is proposing its L-15 for the Pakistan Air Force’s (PAF) lead-in-fighter-trainer (LIFT) program and so on. However, while China and Turkey dominated the big-ticket space, Western European companies were in a strong position for subsystem contracts. The Italian electronics company Elettronica maintained a large exhibit showcasing its electronic warfare (EW) and electronic support measures (ESM) solutions. Some of these have even made it to the PN’s ATR-72 maritime patrol aircraft (MPA), while others are being pushed to the PAF for use on the JF-17 multi-role fighter. RAMSYS from Germany was also promoting the Rolling Airframe Missile (RAM) for use on the PN’s forthcoming MILGEM corvettes and existing warships. One notable factor at IDEAS 2018 was the increased presence of South Korean defence vendors, namely Kia Motors and Poongsan. Kia Motors in particular is banking on a local partnership with Hajvairy Group to promote its KM1 Light Tactical Vehicle (KLTV) to the Pakistan Army. Kia Motors and Hajvairy Group will be competing against Cavalier Group and others for this bid, which alludes to the LAVA (i.e., ‘Light Armed Vehicle Assault’) program listed in the 2015-2016 Ministry of Defence Production (MoDP) yearbook. While it is unclear if the Army will finalize a LAVA/LTV contract, the intended objective – as explained to Quwa by both Hajvairy Group and Cavalier Group – is that the design will, ultimately, be procured in sufficiently large numbers to justify local manufacturing at Heavy Industries Taxila (HIT).